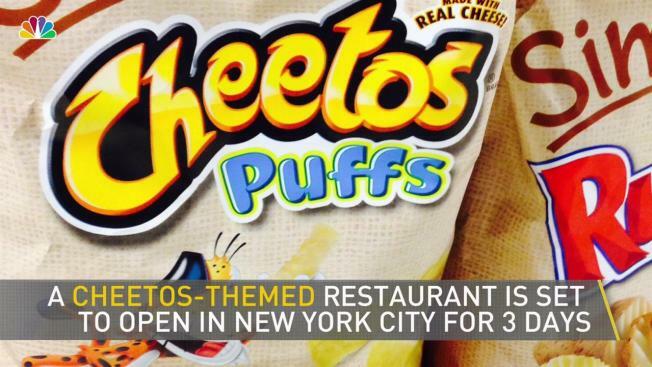 An unapologetically Cheetos-themed restaurant is about to open in New York City, and Cheetos tacos, Cheetos fried pickles and Cheetos cheesecake are all on the menu. The Spotted Cheetah pop-up restaurant will only be open for three days, though, from August 15 through August 17, so Cheetos fans will have to hurry if they want the dine-in experience at 211 West Broadway in Tribeca. Anne Burrell of The Food Network designed all the zany Cheetos-themed dishes on the menu, according to the restaurant's website. Appetizers include Cheetos crusted fried pickles and creamy ranch, Cheetos meatballs and fried green tomatoes breaded in White Cheddar Cheetos crust. Mac n' cheese made with White Cheddar Cheetos, jalapenos and bacon; chicken fillet crusted with four flavors of Cheetos; and Flamin' Hot Cheetah tacos are all on offer for the main courses. And desserts include Cheetos Sweetos crusted cheesecake; Cheetos Sweetos sweet and salty cookies; and White Cheddar Cheetos and Cheetos Sweetos apple crepes. The Spotted Cheetah will be open from 8:30 p.m. to 11:30 p.m. on the August 15, then from 6 through 11:30 p.m. on August 16 and 17. Reservations can be made at Open Table.